>3M Lithographers Tape #616 - 1/2 in. x 72 yds. 3M Lithographers Tape #616 - 1/2 in. x 72 yds. 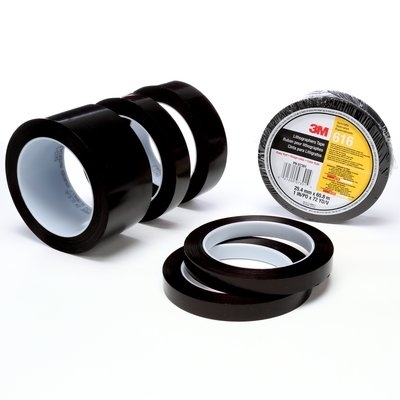 3M Lithographers Tape 616 is an optically transparent and photographically opaque tape primarily designed for many lithographic stripping applications in the graphic arts industry. It is available in a wide selection of widths and lengths to meet almost any demand. 3M Lithographers Tape 616 is a Ruby Red 2.4 mil unplasticized polyvinyl chloride (UPVC) film tape with a rubber adhesive. The low caliper, pin-hole free, colored backing allows for accurate positioning while minimizing ghosting and simultaneously providing sharper definition with a continuous opacity to light to help minimize retouching. This tape is resistant to changing atmospheric conditions which allows for repeated and extended "burn" times. We've designed this tape with a firm, long-aging rubber adhesive that is resistant to softening. It resists oozing during both application and storage, ensuring a long life and continued performance during processes. 3M Lithographers Tape #616 - 3/8 in x 72 yds. 3M Lithographers Tape #616 - 3/4 in. x 72 yds. 3M Lithographers Tape #616 - 1 in. x 72 yds.